control panel or your new account email, or log in to the Client Area on Dreamstream. Click one of the tabs above to get started.. 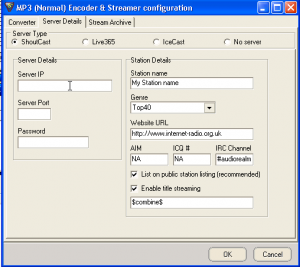 This guide will help you setup your Shoutcast stream in VirtualDJ and broadcast live audio. VirtualDJ is a popular choice for digital DJs and includes a great playlist manager to organize your music. You’ll need a VirtualDJ Pro license in order to use the broadcast features in VirtualDJ. A new popup window will open “VirtualDJ Config. First, make sure you select the Broadcast tab in the left side panel. Select the Radio Server box in the center, under the Broadcast section. This is where you’ll enter your shoutcast info and connect your stream. You will need to find your Radio IP, Radio Port and Radio Password. Check your account setup email or log in and check your Sonic panel. Once logged in to Sonic panel you’ll see your stream info on the right. At this stage you should have your Shoutcast stream info ready. We’ll be using a test shoutcast stream for this tutorial – Radio IP: 193.465.485.55, Radio Port: 9943, Password: 95765. Next option, “Protocol” select Shoutcast from the drop-down, for Encoding Quality set your stream bit-rate limit. Next “Server URL” enter your Radio IP in this field, for Server Port enter your Radio Port, and Radio Password. “Session Genre” you can enter your music style. That’s about it, all you have to do now is click the “Start Broadcast” button at the top of the config page. You will know you’re broadcasting when you see text info displayed beside the Start Broadcast button. It will display for example: “Broadcasting On 193.465.485.55, Total Time: 0:00:15 & Current Song info. You can close the Config window now, the encoder will stay connected in the background, you’re live! Start adding music to your playlist, or drag songs from your computer onto the two virtual turntables. To test if your stream is live, log in to your Sonic web panel and listen with the built-in web player. You will see other useful info there, like current listeners, current playing song & last played tracks. Or you can go directly to Shoutcast Status page for your stream by using your Radio IP & Radio Port. Congrats! You have configured your shoutcast stream with VirtualDJ.. have fun streaming! Free or Paid: $299 / Fully-functioning, 14-day trial. This quick guide will help you setup your Shoutcast stream in Sam Broadcaster and broadcast live audio. Sam Broadcaster is another powerful solution for digital DJs, you can broadcast live or set up an AutoDj. You can use the trial version of Sam to test your Shoutcast stream but you'll need to purchase Sam after 14 days. Sam includes it own build-in encoder, making it easy to configure a shoutcast stream and broadcast your music online. Once Sam Broadcaster is installed on your computer, start it up and from the top menu select Window > Encoder. The encoder window is empty, click the + to add a new encoder. 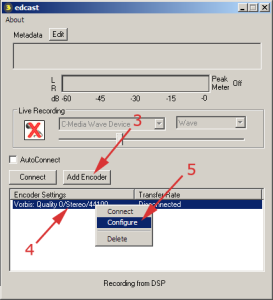 After you select MP3 (normal) a new window will open for Encoder Configuration. Once logged in to Sonic panel you'll see your stream info on the right. We'll be using a test shoutcast stream for this setup: Radio IP: 193.465.485.55, Radio Port: 9943, Radio Password: 95765. The first setting in the Encoder configuration window "Quality" select "Fast Resampling"
For "Format, set this to your stream bit-rate limit, example: 128kb/s 44.1kHz Stereo. Always let your DJs know you stream bit-rate limit, so the stream doesn't auto-stop. Next you need to click the Server Details tab where you'll enter your stream details. This is where you'll enter your Radio IP, Radio Port, Radio Password & other info. Enter your Radio IP for Server IP, Radio Port for Server Port & Radio Password. The Station Details section on the right is optional, you can input some info about your station. The status info in the Encoder should now say connected. Congrats! you're ready to start broadcasting to the world with Sam. This quick guide will help you setup your Shoutcast stream in RadioDJ and broadcast live audio. RadioDJ is one of the most advanced radio automation programs and it's available free of charge. RadioDJ doesn't have a build-in encoder, but you can install 3rd-party plugins and connect to a shoutcast server easily. Download the latest version of RadioDJ from the link above, extract the zip file with a program like WinRar or Winzip. Once you have RadioDJ downloaded, extract the zip file with WinRar or Winzip and you'll be left with the RadioDJ folder. There is no installer, when you extract the zip file, you will get the RadioDJ folder, move the RadioDJ folder to C:RadioDJ. 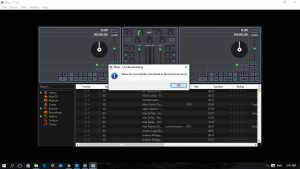 system will prevent RadioDJ from accessing its files. The database stores all the data about your tracks, rotations, playlists, events. For this purpose, we'll need to install MySQL Server, a free database server that can be downloaded from here. So your next step is going to be: Install The MySQL Server. After reading / watching "How to Install MySQL Server" your MySQL Server should be up and running. This utility will create the database for you and allows you to do database related tasks like backup or restore. You should check RadioDJ settings and make sure they are right for your needs. For this, go to Options (bottom menu) and again, Options in the new window. One important setting to check, is the Album Art folder. Make sure that it points to a existing folder, otherwise you could get some errors when importing your audio files. After you’ve customized the settings, proceed to Categories, you can find them in main window Options->Categories. Make sure each categories has at least 1 sub-category, tracks are imported to sub-categories and not main categories. When you're done, you can import your audio files to the proper categories/subcategories/genres. For this operation, go to Options->Directory Import or Track Import (if you need to import your files one by one). Please be careful when assigning the track types to your audio files! Most of the track types have different behavior. Track Types In RadioDJ When the import process has ended, the next step is to build your first rotation. From your categories, you can add to the list categories/subcategories/genres and the generated playlist by AutoDJ will follow that format. When you’re done with the rotation, in the main window, activate the AutoDJ and a playlist will be generated based on your rotation. That's almost! it for the RadioDJ setup, you even learned how to install the MySQL database! and use an AutoDJ. One last step! We need to install AltaCast Encoder Plugin in RadioDJ and configure your Shoutcast stream. Extract the AltaCast Encoder zip file with WinRar or Winzip, open the folder and go into root > plugins folder. Restart RadioDJ, you should now see the option for AltaCast in the top menu. Go to: Options>Plugins>Highlight Altacast> Settings> Place it into a zone. Click the AltaCast button in RadioDJ, then click the green + symbol to add a new encoder. This opens new window called Encoder Details. Radio IP: 193.465.485.55, Radio Port: 9943, Radio Password: 95765. This will be whatever bit-rate your Shoutcast/Icecast server is set to receive. Samplerate: This will be either 22050 or 44100 depending on the bit-rate you're streaming at. 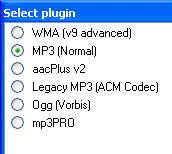 Encoder type: Here you have four options: mp3, AAC+, Ogg Vorbis, Opus. Ogg Vorbis and Opus only work with Icecast V2 servers. Server Type: Either Icecast, Shoutcast or Shoutcast V2. Server Password: The Radio Password for your shoutcast stream. Stream ID: This is used for Shoutcast V2. Reconnect Seconds: This is the amount of time in seconds the encoder will attempt to reconnect after a disconnection. Click save stream and if you have your configuration settings correct the encoder should be streaming within seconds. N.B: You have to manually start the encoders on their first run. There have been reports of some users having issues with the Altacast plugin. your PC and your streaming server it may cause the Altacast plugin to freeze RadioDJ briefly. It’s a known problem and the developer of Altacast will get it sorted when he is able to devote time to the project. At the moment “Life” seems to be getting in the way of him being able to develop it any further. You may also get better results using the other RadioDJ Streaming Plugin written by the guy who codes RadioDJ. Congrats! you're ready to start broadcasting live music and AutoDJ playlists from your computer. This quick guide will help you configure your shoutcast stream with Mixxx DJ software and broadcast live audio. Another great piece of software that allows you to stream live music or AutoDJ playlists to listeners world-wide. Starting with version 1.9.0, Mixxx directly supports live broadcasting which lets you connect to Shoutcast and Icecast servers. Using the preferences dialogue in Mixxx, you can simply supply all the information needed to establish a server connection. Downloaded Mixxx from the link above, at the end of the installation you'll be asked to choose a music directory on your computer. The music directory you choose here will be loaded into Mixxx, you can change this later by going to Options > Preferences > Library. This makes it easy to manage your music files in Mixxx playlist manager, you can drag any audio file onto the two virtual turntables. Mixxx has a lot of Short-keys to quickly access different features, you can read more about Mixxx Short-keys here. The Short-key we need is "Ctrl + L" this will connect or disconnect the shoutcast encoder so you can stream live music. If you don't install lame_enc.dll, you'll get a warning about not being able to record or stream mp3s without the encoder. We'll use Short-key "Ctrl + L" to connect the encoder in Mixxx, but first you need to setup your Shoutcast stream info. Click "Options > Preferences" this will bring up the Preferences window, click the "Live Broadcasting" tab on the left. Locate your Shoutcast Radio IP, Radio Port and Radio Password. You'll find this info in your radio panel or new account details email. Your stream info is displayed on the right in your WHMSonic panel. 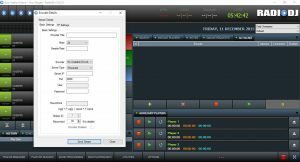 At this stage you should be ready to configure the Live Broadcasting encoder. We’ll be using a test shoutcast stream for this setup: Radio IP: 193.465.485.55, Radio Port: 9943, Radio Password: 95765. The first option in the Preferences window is "Enable Live Broadcasting" you can tick this box. For "Mount" leave it empty. For "Port" enter your Radio Port. For "Password" enter your Radio Password. You can tick "Public Stream" if you want your stream listed on the Shoutcast.com radio directory. By default all Dreamstream Shoutcast streams are listed as public streams on Shoutcast directory. Leave UTF-8 encoding for metadata & Dynamically update Ogg Vorbis metadata unticked for now. Optional Info: Stream Name, Website, Description & Genre, enter some info about your station. Make sure to enter your stream bit-rate limit, and always let your DJs know your bit-rate limit. If someone goes over your bit-rate limit, the server stops the streams until the admin restarts it. You can find your bit-rate stream limit in the Sonic panel, on the right under My Account section. You can enable the Custom Metadata option if you want to enter some info about an artist or song. That's it! you're done setting up your Shoutcast stream, click OK to close the Preferences window. The very last step, got back to Mixxx, use the Shout-key "Ctrl + L" to connect the encoder in Mixxx. A new window will pop up letting you know that the encoder is connected to the shoutcast server. Setup your first AutoDJ playlist, and use Short-keys to automatically connect the encoder to your Shoutcast stream! 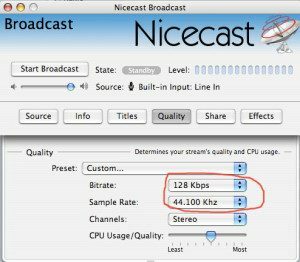 Nicecast is a stand-alone program that lets you broadcast live audio from your Mac to your online listeners. 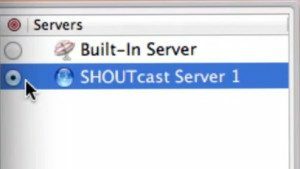 This quick guide will help you configure your Shoutcast stream with Nicecast and broadcast live audio online. When connected, Nicecast will listen to your sound-card for any audio, and stream it live to a shoutcast server and out to your listeners. You could play music from an external source, your computer or iTunes library, Nicecast will pick up the audio source and broadcast it. If you use the trial version, noise is overlaid on any broadcast longer than 60 minutes, to unlock the full version, purchase a license key. You can use the free version of Nicecast for this tutorial for test purposes, if it doesn't work for you, then you're not wasting your money. 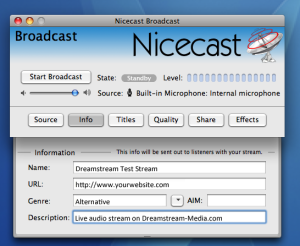 Once you have Nicecast on your apple mac computer, run Nicecast and select "Window" from the top menu, then select "Show Server" This will bring up the Server window which allows you to enter your Shoutcast stream details and connect to a Shoutcast server. You'll need your Radio IP, Radio Port and Radio Password, check your account setup email or log in and check your Sonic panel. Once logged in to your Sonic panel, you'll see your stream info on the right. At this stage you should have your Shoutcast info ready. I'm using a test Shoutcast stream for this guide: Radio IP: 193.465.485.55, Radio Port: 9943, Radio Password: 95765. You'll need to add a new server to the list in the Servers window. Click the small + sign in the Servers window to add a new server. A new window will open called "Nicecast Server"
This is where you'll enter your Shoutcast details. In the first field "Name" enter anything you like, enter a name for your Shoutcast station. Server Type: Select Shoutcast from the drop-down, works with Shoutcast Version 1 or 2. Next go back up to the "Password" field, enter your Radio Password. Make sure you enter this info correctly, without spaces or the stream won't connect. In the Servers window, make sure you select your new server. Enable the small blue bubble in front of your new server. Before you can connect and start streaming live, you'll need to fill in some other info for your Shoutcast stream. In the Nicecast Broadcast window, click on the Info button. You will enter some info about your Shoutcast radio here. To avoid any issues with Nicecast, please fill in all fields. Enter some info for Name, URL, Genre and Description. Name: Enter anything you like, a name for your stream. URL: Enter an URL for your website or radio web page. Genre: Enter a music genre: Example: Alternative, rock. Description: Write a short description about your stream. Next you need to configure stream quality, click the Quality button. 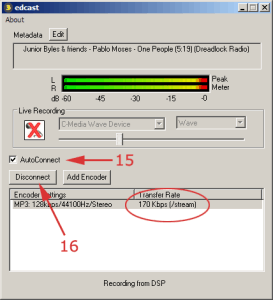 This is where you'll set the stream Bit-rate and Sample Rate for your stream. You'll find the Bit-rate limit in your welcome email or your web panel. Log in to your Sonic panel, your bit-rate limit is displayed on the right. If your Bit-rate limit is 128 kbps, select 128 kbps. For Sample Rate just leave it set to 44.100 khz. Always let your DJs know your stream Bit-rate limit, Dreamstream servers use Bit-rate control features to avoid Bit-rate abuse. If someone goes over their Bit-rate limit the stream stops and needs a restart. That's it for Nicecast configuration, if you followed these steps, Nicecast is set up correctly. You should see some status info in Nicecast, On-Air indication. You have configured Nicecast to broadcast live audio, from any source, to a Shoutcast server. This quick guide will help you configure your shoutcast stream with Edcast and broadcast live audio on the web. Edcast is a stand-alone program that lets you broadcast live audio from your computer to your online listeners. When connected, Edcast listens to your sound-card for any audio source, and stream it live to a shoutcast server and out to your listeners. You could be playing music from an external source into your computer, listening to music on your computer, Edcast will stream it live. Step 1. Install Edcast Download Edcast Standalone from the link above and install it on your computer. Edcast can be used for broadcasting live audio to an Icecast or Shoutcast server. You could also use Edcast to re-stream an AM/FM radio station over the internet. 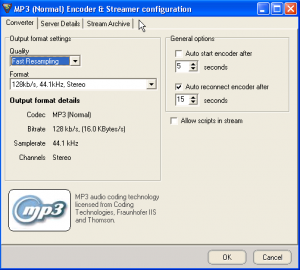 You'll also need the LAME MP3 Encoder dll file, this is required so Edcast can stream mp3 files. 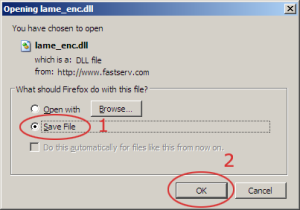 Right click the link above and save the lame_enc.dll inside the folder where your installed Edcast. It is very important that you save this file in the actual Edcast program folder. 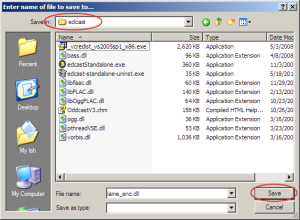 Navigate to ‘C: Program Files edcast’ and click ‘Save’. (6) Enter your chosen bitrate - this must be equal or lower than the rate you purchased. (7) Enter your samplerate - Enter 44100 for bitrates above 96, or 22050 for streams below 96. (8) Number of channels - Enter 2 for bitrates above 48, choose 1 for bitrates below 48. 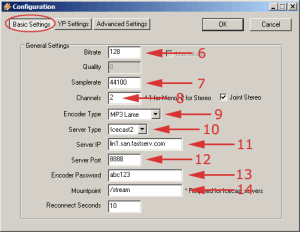 (10) Select ‘Icecast2’ for Icecast server, or ‘Shoutcast’ for Shoutcast server. (11) Enter the host name of your server. (12) Enter the port number of your server. (14) (Icecast2 only) Enter the mount point - this will usually be /stream by default for Fast Serv Icecast2 servers. Enter a short description for your station. Enter your website or radio website URL. Enter some music genres for your station. You should see information about the encoder status in the ‘Transfer Rate’ column. If it’s working properly, a numeric value will appear indicating the transmission speed. If you are unable to connect, go back to step 4 and double check every server setting. You must also make sure there is music playing in Winamp or whatever media player you're using. You can then select the audio device you wish to capture audio from - select it under ‘Live Recording’. We hope you find these tutorials useful. For help please contact us online or in-world.